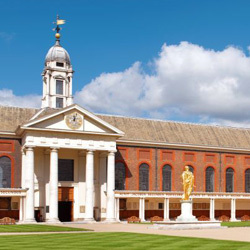 On the banks of the Thames, in the heart of one of London’s most fashionable districts, the Royal Hospital Chelsea offers a number of historic and beautiful spaces to hire, both inside and out. This famous venue offers more than just a picturesque backdrop for your event, with six versatile spaces available to hire and private parking. We will work closely with the venues experienced and dedicated events team to ensure the success of your special occasion. With its richly panelled walls, fine oil paintings and beautiful 17th century mural by Antonio Verrio, the impressive Great Hall is the largest of our indoor spaces and is little changed since Sir Christopher Wren first designed it more than 300 years ago. The two rooms of the elegant State Apartments – the Council Chamber and the Ante-Room – boast a prestigious history of entertaining monarchs and other notable figures since the late 17th century. The stunning Wren Chapel, with its sonorous acoustics, is available for use for a number of different events including concerts, carol concerts, debates, lectures and media launches. Wren House is positioned at the end of the west wing at the Royal Hospital Chelsea and is a similar size to the State Apartments. Boasting magnificent views across the Royal Hospital’s gardens and out towards the Thames this is the perfect space for more intimate gatherings and dinners. With direct access to the South Grounds and Figure Court it offers the flexibility of combining both an indoor and outdoor event. 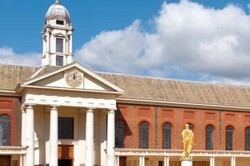 The elegant Figure Court lies at the very heart of Wren’s original design for the Royal Hospital. Bordered by the State Apartments, the Chapel and the Great Hall. Available for hire separately or in addition to the Great Hall and the State Apartments. Ranelagh Gardens is one of London’s hidden gems. Tucked away in the extensive grounds of the Royal Hospital, these magical gardens provide an ideal outdoor space for a whole host of events, from theatrical productions and children’s parties, to summer drinks receptions. Ideal for corporate sports or team building events, Burton Court facilities include tennis courts, a football pitch and a cricket pitch with nets, as well as a large area of green space suitable for a wide range of activities.